She added that it’s 'simply wonderful' to see everyone’s joy after their hopes of the woman having a child became a reality. 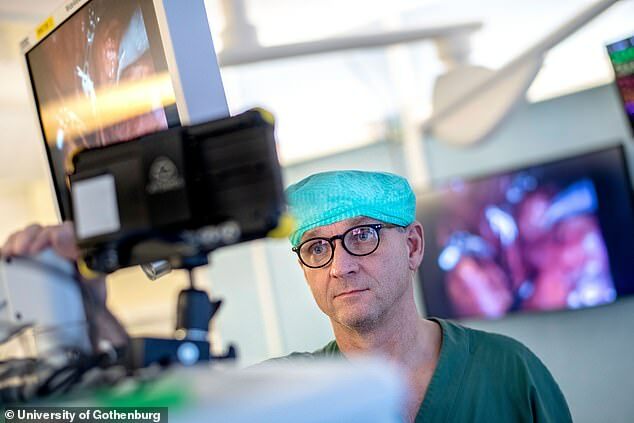 Professor Mats Brännström, who led the procedure, said: 'This is an extremely important step towards developing the surgery involved in uterine transplantation, and its safety. However, the latest birth is the first to have been born through a womb transplant that used robots. 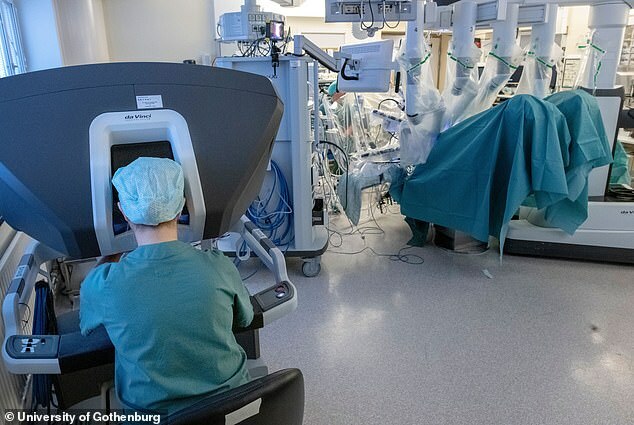 Five other women have undergone womb transplants through robotic surgery at the University of Gothenburg. However, none of them have yet to become pregnant. 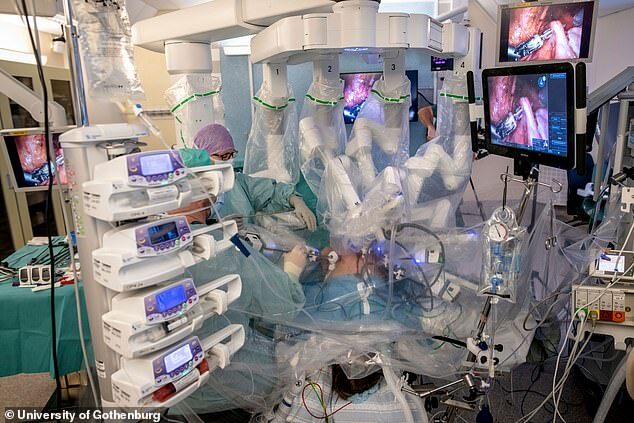 Doctors said using robots for the life-changing procedure has 'a great future' and makes the surgery less damaging for donors. 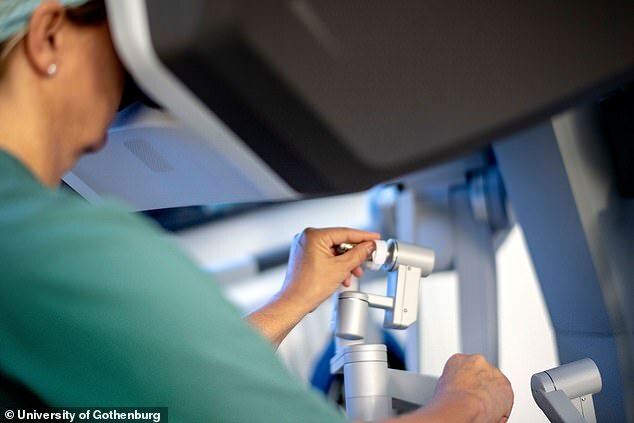 The robot is controlled by two surgeons who use joysticks which convert their movements into millimetre-precise motions in the robot arms. This allows the procedure to be done through five 1cm-wide holes in the donor's body - unlike much bigger cuts needed by human surgeons. The doctors said this leads to the patients losing less blood and spending less time in hospital after donating their womb. The other babies born after uterus transplants have been in Sweden, with others in the US, Brazil, Serbia and India. Doctors have warned there is a shortage of living donors, and most women that give away their womb to be transplanted are family members or close friends. The robotic breakthrough comes after another world-first last year, in which it was revealed a baby had been born from a uterus transplanted from a dead donor. The successful pregnancy of 32-year-old Fabiana Amorim de Lima, from Brazil, marked a breakthrough in fertility treatment. Her eggs had been frozen before the operation and, after she started having regular periods following the womb transplant, she was impregnated using IVF. Luisa Santos was born by c-section in December 2017, 35 weeks into the pregnancy. Doctors said the use of a dead woman's womb offered hope for future mothers-to-be because it meant it would be easier to find a willing and suitable donor. Ten previous attempts, in the US, Czech Republic and Turkey, to transplant a womb from a dead donor had ended in failure. Luisa's delivery last December – in which she weighed 5lb 10oz – proved the procedure can be carried out safely using a dead donor's womb. Spurred on by the breakthrough, UK surgeons are planning the first womb transplants in this country this year.